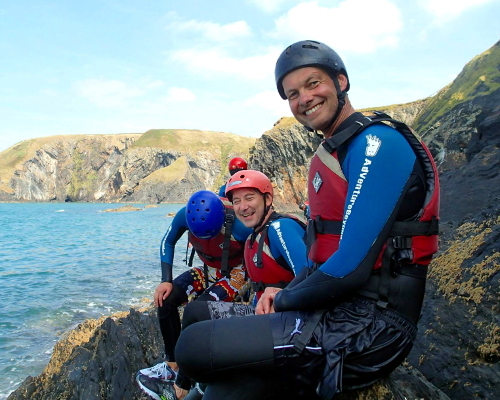 Coasteering was born here in West Wales, inspired by the rugged coastline of West Pembrokeshire. 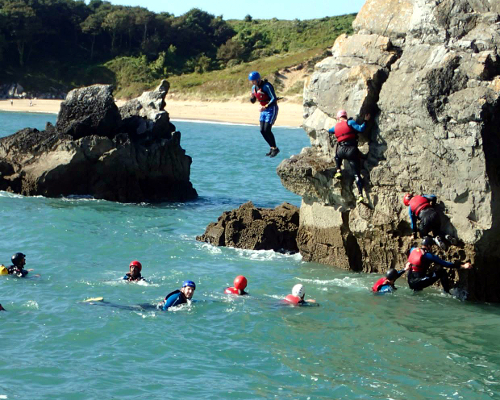 Coasteering is a journey along the tidal margin which combines a mix of swimming, scrambling and jumping. No two Coasteer's are ever the same—mind, waves and tide are constantly changing the sea conditions so you’re always guaranteed a unique journey. Coasteering is an active journey along the tidal margin which presents challenges along the way. Using a mix of climbing, scrambling, leaping, traversing, swimming, sliding, ducking and jumping you will experience our wild coast through the zawns, gullies, caves, cliffs, reefs of the Pembrokeshire and Cardigan Bay coast. Cardigan Bay Active provides both family and adult Coasteering sessions which allows us to cater for all the needs of your group. Our qualified, local instructors will lead your group into areas of the coast which would be inaccessible unless you give it a go, giving you the opportunity to see spectacular geology and marine life in untouched habitats. We split our Coasteering adventures to cater for family groups with young children and the older and perhaps more adventurous to ensure that nobody is pushed outside what they feel comfortable doing, and provide a safe and enjoyable experience no matter what your age ability and experience. All required safety equipment for your Coasteering Session. Shorts to go over the wetsuit, this is to help protect the wetsuit. All of our coasteering trips return to the same location. Can we do Coasteering in the rain? Yes - Coasteering in the rain is fine, personally I love heavy rain when swimming in water watching the rain drops land and erupt. Rough seas can make the coasteering more fun in most cases, however it is really rough we will contact you prior to the session to make alternative arrangements. This could be a different location which is protected from the rough sea or an alternative activity if they sea really is unsafe to be in. Yes: people do where contact lenses coasteering and say its ok but I don't where them so just go on others word. Glasses can be worn but its best to have a leash attached. If they fall off or get broken we can not be held responsible. If they are important to your driving think wisely before taking on session. Large and small groups can be accommodated for coasteering sessions please contact us for more information. No it is unnecessary for any of our coasteering sessions. We provide you with enough floating kit that all you need to do is move your arms to move around kind of like making snow angels. Yes - we have a wide range of sizes in all of our equipment. Before you head out on your activities our coasteering instructors will ensure that all equipment fits correctly and they'll make any necessary changes. Our Instructors are trained to deal with different situations, so we can easily accommodate people with diabetes, asthma, mild epilepsy, autism and more. Please contact us if you have any questions. If you require a waterproof container to bring medication please let us know in advance.